During the Civil War, the soldiers in United States Army were largely volunteers from all walks of life. However, between 1865 and 1874 things radically changed. Almost half of the new recruits were now Irish and German immigrants with few skills. Most could not read or write, and very few had ever mounted a horse. Alcoholism was common, and deserters so prevalent that General Sherman once stated that there no need to worry about populating the Great Plains because army deserters would provide more than enough settlers. The exception to this statement were the Buffalo Soldiers or African-Americans who had almost no deserters. At the conclusion of the Civil War, it was decided that two cavalry units and four infantry regiments would be made up entirely by African American troops, and that they would be commanded by white officers. When the war ended it was decided that black soldiers would only be allowed to serve west of the Mississippi River because of the hostile attitude towards them in the Southern United States. At the time the United States military was still blatantly opposed to black officers, despite the fact that over 175,000 African-American soldiers had fought valiantly in the Civil War. Even more amazing, at the conclusion of the war many white officers still blatantly refused to command black troops. Probably, the best known of these was George Armstrong Custer. Custer choice to take a drop in rank rather that command black troops. 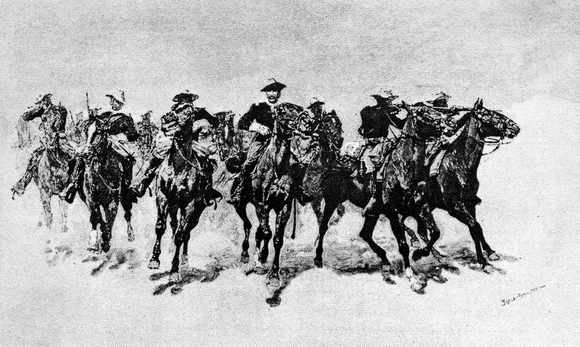 No one knows exactly why the Plains Indians started calling the African-American troops Buffalo Soldiers. Most believe that the African-Americans hair reminded the Pueblo Indians of the thick, black, coarse buffalo mane. Others believe that they had in the Indians estimate, fought with the strength of a buffalo. One thing, that we do know for sure is that their life in the plains was extremely difficult. On an average they made about $13 a month, and the food and living conditions were usually horrible. They largely survived by eating beans, salt pork, and biscuits. Fresh vegetables and fruits were rare seldom seen on dinner plate, and scurry and dysentery were common. Many of the forts, were only holes in the ground with little protection from the elements. Most of the forts lacked defensive walls, and barely resembled what we think of as an actual fort. Temperatures of 20 or 30 below zero were common in the winter. Guards were forced to wrap themselves in buffalo robes to keep from freezing to death. Then, in the summers the temperatures were amazingly hot and humid, and the mosquitoes were horrendous. Probably, the best known of all of the African-American regiments was the Tenth Cavalry who were stationed at Fort Leavenworth. Despite having inferior weapons and horses the 10th manged to hold their own against the Cheyenne and Apache. In fact, Sgt. William McBrayer fought so valiantly against the legendary Geronimo that he became the first African-American to win the Congressional Medal of Honor. In all, during the Indian Wars 13 enlisted men and 4 officers from Buffalo Soldier regiments would receive the Medal of Honor.